Darlene G. “Woody” Woodruff was born to Niels L. and Winifred C. (Theyken) Nielson on May 18, 1935 in Allentown, Pennsylvania. In 1953 she graduated from Palisades High School in Kintersville, Pennsylvania and soon after graduation, enlisted in the Women’s Army Corp and was assigned to basic training at Ft. Lee, Virginia eventually receiving a permanent assignment to Governor’s Island, New York. After one year of service she asked for and was granted an assignment to Tokyo Army Hospital in Japan where she received training as a medical technician allowing her to perform many nursing tasks not allowed in the civilian sector. Consequently, upon returning to civilian life, she worked as a certified nursing assistant (CNA) rather than as a licensed practical nurse. After being discharged from the Army she attended Millersville State Teacher’s College in Pennsylvania and eventually changed her career choice to nursing and moved to Boulder, Colorado where she met her future husband, Lester E. Woodruff. They were married on December 22, 1960 in Palm Springs, California. In 1962 Woody attended County Hospital School of Nursing in Las Vegas to become a Licensed Practical Nurse (LPN). After working for many years as a LPN at Sunrise Hospital in Las Vegas she returned to school earning her Associate of Applied Science in Nursing (AAN) degree from the University of Nevada Las Vegas (UNLV) in 1981, her Bachelor of Science in Nursing (BSN) degree in 1984 and her Master of Science in Nursing (MSN) degree in 1990. After working 27 years as a nurse at Sunrise Hospital (now Humana) with 24 of those years being in a 75 bed Intensive Care Unit, Woody and Lester moved to Powell, Wyoming after Woody accepted a faculty position in the nursing department at Northwest College. Much planning went into her classes and she cherished the times when she see could students “get the meaning” of what she was explaining. 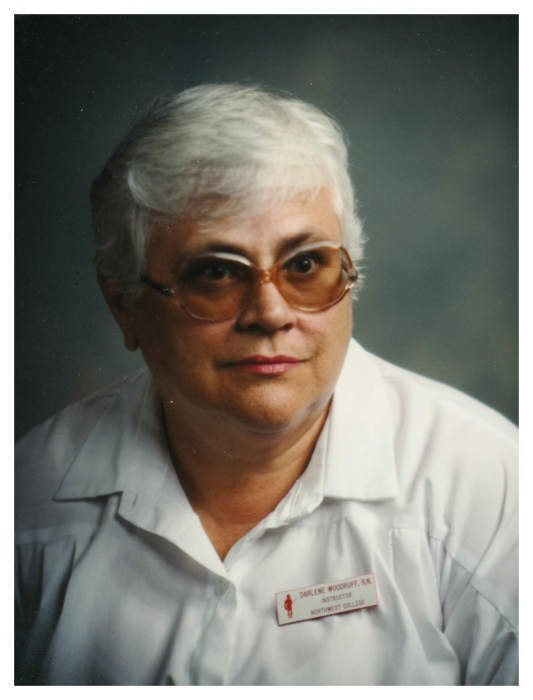 She retired from Northwest College in 2002 and enjoyed traveling to Pennsylvania to visit family and friends, gardening, reading, watching movies and taking road trips to various places in the Big Horn Basin, the nearby mountains and Yellowstone National Park. Woody passed away at St. Vincent’s Hospital in Billings, MT following a two month battle with cancer on Wednesday, August 15, 2018 at the age of 83. She was preceded in death by her husband Lester in 1995, her parents, brother Robert Nielson and sisters Gail Horn and Judith Cadzow. Woody wants to be remembered as a Christian who did the best she could with her life. She loved her family and friends. She is survived by brothers Niels Nielson Jr., Bruce Nielson and her sisters Terry Chuchman and Trudy Henthorn all of Pennsylvania as well as her step daughters Nancy Schwartz and her husband Jim of Buffalo, MN and Jane Chang and her husband, Dr. Hsien-Hsin of Bloomington, MN and as well as two grandchildren Christine Chang of Boulder, CO and Andrew Chang and his wife Vicki and their daughter Ela of Scotland as well as a host of friends and former students. And last, but not least, her cherished and very spoiled cat, Trouble (and yes, the name is very appropriate). Memorials may be given to the Powell Valley Animal Shelter or to the Northwest College Foundation Nursing Scholarship Fund.